This area of the state is largely unknown to us. We visited Lassen NP once, and ran a marathon in Susanville, but have not explored the Northeast corner further. I got the notion that we should venture out for an overnight stay in Paradise, which is in the foothills above Chico, so that’s what we did. Everything we do now has to involve birds, so I checked out the birding prospects more than, say, accommodations, or the roads I was supposed to take to get there. I trusted Google Maps to give me the directions, and it had us go a long way on CA 70. It’s a classic two-lane state highway, and thankfully was not especially busy. 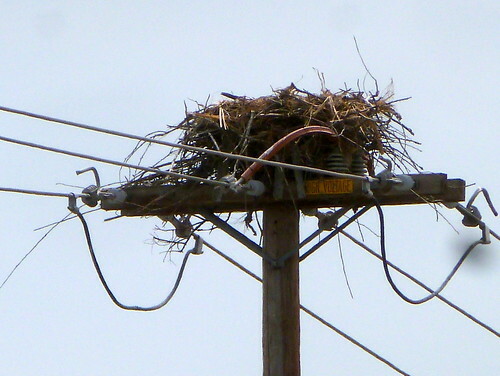 Between Marysville and Oroville we saw this huge Osprey nest on a utility pole. If you click through to the full size image you might just barely see the tail and head of a juvenile Osprey in there. One of the adults was on the nest when we drove up, but flew off before I could immortalize him or her. Nearby we saw a Yellow-billed Magpie along the road, which is a new addition to the List. They’re almost exactly like the Black-billed Magpie (check the bills) which is common across the west, but the Yellow-billed are just here. After that we saw dozens of Great Egrets roosting in tall trees off the highway. So the car birding is pretty good around here. We made it to Paradise and checked in, then strolled down the bike path that runs through town on our way to dinner at Annie’s Country Cafe. It has been our practice to select restaurants named “Annie’s (something)” when faced with a random selection of unknowns, but we may have to rethink that. Annie’s was nice, but probably not worth the walk down there. The menu had a limited wine and beer selection. All of the beers were Coors variations, except for “pale ale”. I ordered that, and it turned out to be Sierra Nevada. Resident Expert noted our proximity to Chico, where everything within a 100 mile radius called “pale ale” is Sierra Nevada. We had to walk part of the way to Annie’s on The Skyway, which doesn’t really have sidewalks, but does have cars bombing past at 40 mph. Along the way we passed by this. The birding in Paradise was not exceptional. I can report that the Western Scrub Jay population is in excellent shape. Not that we were too worried. The Northern Flicker is common here, based on my seeing two of them in different locations. But I wanted more unusual mountain birds, and it wasn’t happening. The next morning we drove around town to see if it lived up to its name. Saw a few birds at Billie Park, and heard quite a few in the beautiful open forests east of town. On the way back we stopped for birding at the Oroville Wildlife Area. Now we’re talking! Even at mid-day the birds were abundant. A good variety of birds, including another newcomer to the List, the Bullock’s Oriole. Then the long drive home, now in possession of very limited familiarity with Butte County.